United States - Do you approve of marriage between Blacks and Whites? This statistic shows the results of a survey conducted irregularly between 1958 and 2013 among adult Americans, asking them if they approve of marriage between people of different skin color. While in 1958, only 4 percent stated they approved of intermarriages, 87 percent said the same in 2013. 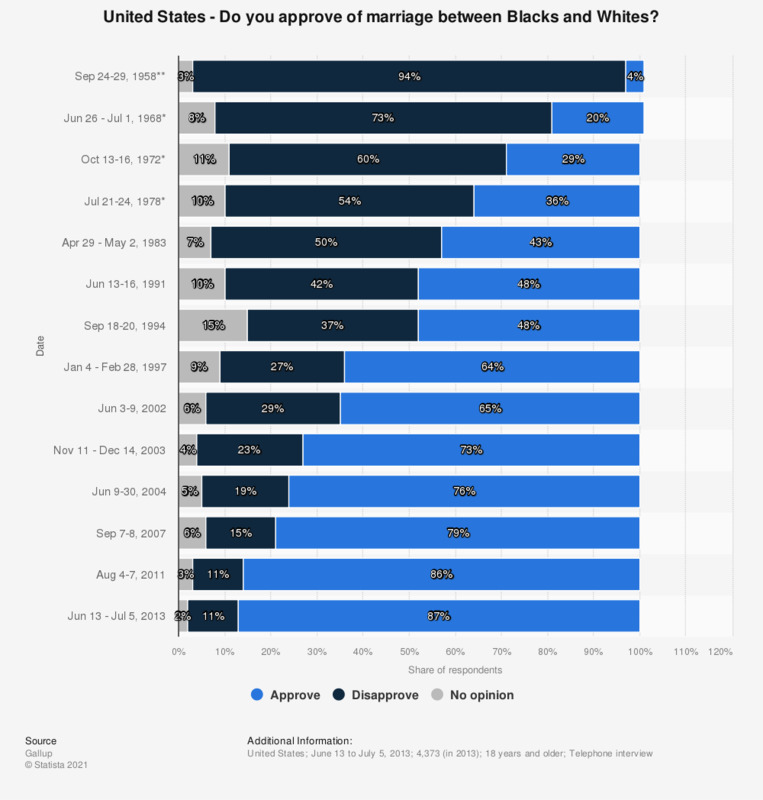 The remarkable change in approval of interracial marriage amongst Americans displays an ongoing trend of public acceptance of lifestyles that were once disapproved of. The once frowned-upon concept of interracial relationships has correspondingly changed with the evolution of American culture as well as new generations. Interracial relationships were often a topic of debate, however, these debates have since become less conservative, with many citing the positivity of racially mixed marriages for the development of society. The United States, despite its history, has become an openly diverse country, with a multitude of immigrants becoming legal U.S. citizens and gaining rights, most notably from Asia. Based on a recent survey in 2010, it was evident that interracial marriages in the United States were primarily present with Hispanics and Asians. The change in the opinion of U.S. citizens regarding interracial marriage is obvious within the different generations, whether it is the older or the younger; however the concept is most definitely easier accepted within the latter, something that is most evidently seen within pop culture and sports. The source does not provide details regarding the number of respondents for data prior to 2013. The source does not provide information regarding percentage points missing to or exceeding 100 percent. *According to the source, the wording was "between whites and non-whites". **According to the source, the wording was "between white and colored people". Do you agree that all women dream of getting married?